We meet for worship every Sunday at 10.30 a.m. This service aims to meet the needs of all ages, from the over 90s to those under 3 months. We have a crèche for babies and children under three. The service lasts about an hour and includes Holy Communion on the third Sunday of each month. Worship begins with everyone together. After the offertory prayer the Young Worshippers go to the halls for activities suited to their age groups. Adult staff prepare and lead these sessions, linked to the worship theme for that day. Sometimes our worship includes children, young people and adults throughout, as when we have a Parade Service for our uniformed organisations several times a year. We also have a midweek informal reflection, held in the church vestibule, which everyone is welcome to join. Held on the second Wednesday of each month and starting at 11.45am., this is especially suited to those who may find it difficult to attend Sunday morning worship. 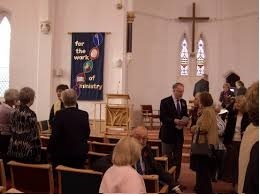 It is followed by refreshments and there is an invitation to bring and share a light lunch if you wish to. This is an informal style of worship for everyone, regardless of age – all having fun with craft, food, games, singing and stories. It takes place 4pm – 6pm the 1st Sunday of every month except January and August. This is our normal pattern but sometimes it changes so please check each month.